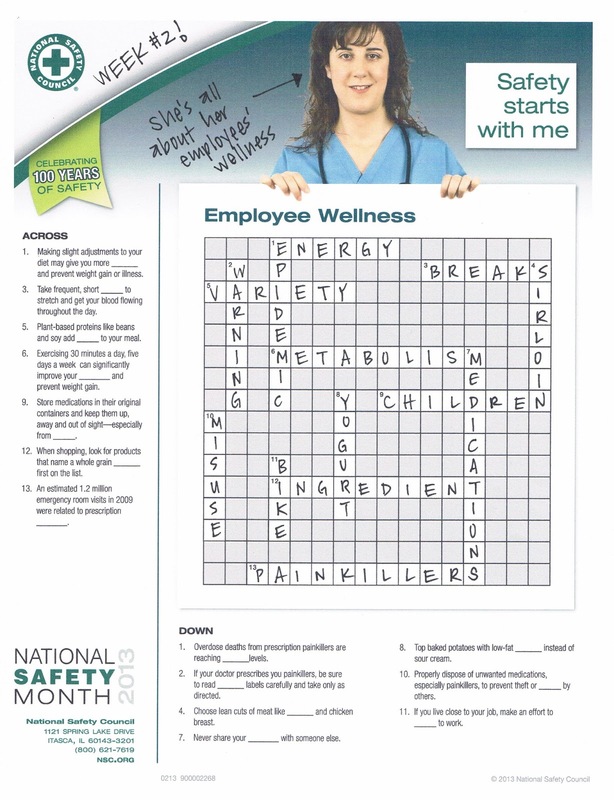 Since this week of National Safety Month was all about employee wellness, I completed the National Safety Council's crossword puzzle* on employee wellness. So what did we learn about this week? 5) Plant-based proteins like beans and soy add variety to your meal. * tips from the National Safety Council crossword puzzle referenced above. And now? My tale of being vegetarian for 5 months. Mighty Spouse and I decided (after watching one of those "where does your food REALLY come from?" documentaries to become vegetarian. It didn't last very long, about five months. The reason we stopped? We were both gaining weight again. When we first went veggie, we lost 15-20 pounds each over the first two months. It was awesome. Gaining it back was less awesome. After we moved to Prescott and realized it would be dang tricky to be vegetarian in rural-ish Arizona, and evaluated how much extra money we spent on groceries every week buying the non-meat food, we decided a compromise was in order. Moderation in all things and all that. Now we eat LESS meat than before, we juice tasty greens and fruits, and we're back to the simple, cheap, fast and easy meals we used to eat. Also, Mighty Spouse forbade me from ever eating ramen noodles again - we used to eat it frequently when we were in high school and college. I bought a few packages on a lark, read the back of them when I got home, and now am pretty sure I will have to feed them to Shadow. It looks so tasty even now. Mmmm. Oriental flavor ramen noodle soup. But then you flip it over and think "ZOMG I can't eat that!" I especially love that it says "0 grams Trans Fat" in the corner and the packaging has been the same for as long as I remember. Small print below the "0 grams Trans Fat" states: SEE NUTRITION FACTS FOR SODIUM INFO. Uh oh. I'd like to point out that, prior to turning 25, I never looked at labels on food. In the nutrition facts, it notes that the serving size is 1/2 block of noodles with seasoning. I can't imagine who would be sated by a half package of ramen (yes, I know, it's supposed to be an appetizer or side or something). On the (sort of) plus side, the first ingredient in the noodles is enriched wheat flour. On the down side, the first ingredient in the soup mix is salt. At approximately 10 cents a package (or less) when on sale, this unassuming food item helped me not die of starvation during college. I'll confess - I ate a package of prepared ramen last week. It was still pretty darn tasty. See you next week. DFTBA.